Mortenson Construction recently wrap-ped up work on Iberdrola Renewables' Penascal II wind farm on the Texas coast, a project that involved adverse weather conditions during construction, including hurricane-type weather. occurred this past summer off the Louisiana coast-the BP oil well spill-the bright future and innovation of the American wind power industry continues to unfold. At a time when the BP spill was on the front pages of newspapers across the country, one of the leading wind power companies in the world, Iberdrola Renewables began commercial operations of the Penascal II wind farm, on the Texas coast. The contrast of clean energy with fossil fuels could not have been clearer. During the erection process on Penascal II, Mortenson Construction established multiple work shifts, and crews were often working from midnight right through to the next morning because the weather conditions were good for erecting the turbines. Penascal II project that, combined with the Penascal I project, is a massive 404 Megawatts. The wind farm site is in Kenedy County, on the western tip of the most southern point of Texas. It sits right on the Gulf of Mexico, about 25 miles from the nearest highway. Penascal has an attribute common to many Texas wind farms-it is in a lightly populated area. In fact, Kenedy County reportedly has the distinction of having the fourth lowest-population of any county in the United States. It actually has more square miles than people. The Penascal II project, being close to the coast and fairly remote, carried its own set of challenges in terms of construction, says Tim Maag, vice president and general manager of Mortenson's Renewable Energy Group. Maag has a concise description of the site. "The terrain can best be described as sand, sand, and more sand-and add to that, blowing sand." In terms of logistics, its location also posed challenges. "It's a very remote site," says Maag. There is not a lot of grade change from one end of the 15,000 acre site to the other, so it's fairly straightforward in that respect. "But in addition to the remote location, we had extreme heat. And since it was on the coast, we battled heavy rains that sometimes created flood-like conditions. And there is a great wind resource there, so we also battled high winds." Although Mortenson Construction has built all sizes of wind farms-from 30 MW to 300 MW-plus-it's the larger projects, in the range of 100 MW and up, that usually offer the best economies of scale, says Tim Maag, vice president and general manager of Mortenson's Renewable Energy Group. "Any time you're working on something in that 100 MW to 300 MW zone, those are the most efficient projects. You can really start to standardize the work and improve the process after the installation of each turbine." One of the company's main goals on any wind power project is to achieve efficiencies-and continue to improve on the process. In fact, Maag noted that Mortenson has its own Kaizen Promotion Office (KPO). Kaizen is Japanese for the "state of continuous improvement". "We've taken Kaizen techniques and applied them to the work site," explains Maag. "We work to instill the KPO manufacturing process on the job site. We monitor each activity and implement rapid improvement processes to find ways to make improvements, to allow the trades people to work more effectively." A specific example on the Penascal project involved the Mitsubishi turbines. Due to their 2.4 MW size, the nacelles on the turbines have to be assembled in the field. "So we had our Kaizen folks working with the trades people that were putting the nacelles together. We mapped each process that we were using to assemble the nacelles and looked for ways to drive out waste. We made a series of small changes that ended up yielding some pretty significant results." At the beginning of the project, it took several days to assemble a nacelle. "We got that down to being able to assemble a nacelle in a single day," says Maag. The Penascal project, in many respects, was the opposite of some other projects Mortenson had worked on in the Midwest Wind Buckle. In locations such as Minnesota, Mortenson's home state, they routinely deal with extreme cold and snow. More often than not, these projects are fairly close to county roads and regional highways, so the haul in to the wind farm site is much more limited. Having visited the Penascal site in advance, and researched the area, Mortenson knew exactly what they were in for: a tough job. "We understood what the challenges were," says Maag. "We pre-planned the Penascal project, and we developed a very specific plan that included a comprehensive safety plan on how we were going to keep our workers safe from the blowing sand. And if hurricane-like conditions came in, we knew what our emergency response plan would be to make sure that all the trades people and team members would be safe throughout the project." It's been a while since the country was hit by a hurricane, but in July 2008, Hurricane Dolly came ashore on nearby Padre Island with winds up to 100 mph. "All this considered, one of the first challenges we had was how are we going to build the project safely-and that was where the majority of the planning and effort was directed," says Maag. At times, Mortenson crews came close-too close-to having to deal with hurricanes during the building of the Penascal II project. In a single day, they received more than five inches of rain in just two hours, as a result of a nearby hurricane. The company put together a site-specific plan that took in the works, weather wise: consideration of blowing sand, extreme weather conditions, and emergency situations such as a hurricane. They also developed and executed a work schedule taking into account the weather. "We established multiple work shifts and were often working from midnight right through to the next morning because the weather conditions were good for the workers, and for erecting the turbines. We had work going on pretty much around the clock on the project. But we were also able to perform work in the most logical sequence." The Penascal II project features 84 Mitsubishi 2.4 Megawatt turbines. As any wind project contractor or developer knows very well, you can put a construction plan together for building a wind farm, but be ready to change it. Mortenson Construction, the contractor on the Penascal II project, is one of the veteran construction companies in wind farm construction. 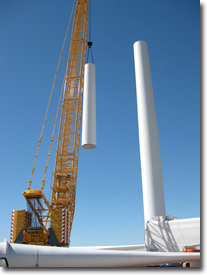 In fact, the company is celebrating its 15th year in wind farm construction in 2010. "We started in the wind business at the infancy level, and we've grown-and we continue to grow and capture market share within the wind power business," says Tim Maag, vice president and general manager of Mortenson's Renewable Energy Group. 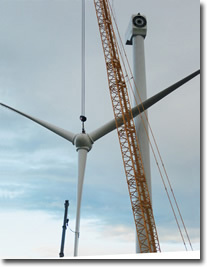 The Pensascal wind farm project is Mortenson's 84th wind project. 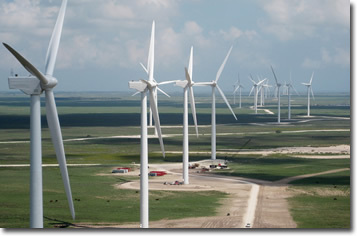 The company expects to finish its 100th wind farm project late this year, or early in 2011. There have been significant changes in wind power in those 15 years. 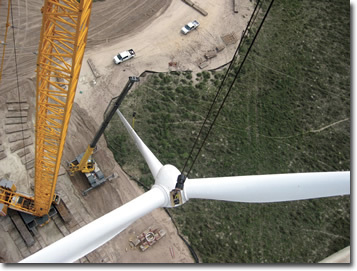 In the mid-1990s, the largest turbine might have been a 1 MW unit, sitting on what was then the tallest tower (65 meters), which required one crane to erect. "That soon evolved into a 1.5 MW unit being one of the smaller machines, and the tower size jumped to 80 meters," says Maag. "It put us in a whole other classification of cranes. "Now, we're looking at 3 MW machines, and this year we'll be doing one of the first major projects in the U.S. with 100-meter towers. We see 100-meter towers as the direction the industry is going." The wind farm sites have become more challenging over those 15 years; the easier sites have been developed, leaving sites that may have tremendous wind resources but less than ideal locations. "With all of that, though, I'd say one thing that hasn't changed is the people who work in the wind industry," says Maag. "They are very focused, pragmatic people, who are focused on doing the right thing. In construction, some of the best people you'll work with are on the renewable energy side." Mortenson, like other companies involved in wind power construction, has seen the ups and downs of U.S. wind power, reflecting the tax credits that may, or may not, be there in any year. The biggest help the industry could get right now is a national Renewable Energy Standard (RES), Maag says. "It's exactly what our industry needs, and I believe we're headed in that direction. It may not be this year, but I think that Congress will pass a RES at some point soon." Though wind power is a major focus for Mortenson, the company decided in 2006 to expand its renewable energy footprint by becoming actively engaged in the biofuels, solar, and hydro markets. For the biofuels marketplace, Mortenson has focused its efforts on the "next generation" of biofuels by supporting customers in their research and development efforts, including the design and construction of pilot scale facilities. On the solar power side, Mortenson has been engaged in preplanning efforts, including the design and construction of photovoltaic (PV) and concentrated solar power (CSP) projects throughout the U.S. Mortenson sees the solar energy market as providing substantial potential for future success and has dedicated resources to this renewable energy market, which is a key element of its long term strategic plan. "You can plan these projects out, and we did," explains Maag, "but to a great extent, we had to be nimble and quick on our feet. We needed to understand, to the best of our abilities, what the weather patterns were doing and then revise our plan accordingly." Essentially, they had a rolling work schedule that was very subject to change, almost entirely due to weather. Maag noted that they came close-too close-to having to deal with hurricanes during the building of the project. "We were carrying out construction right through the hurricane season," he says. "Fortunately, we did not actually experience a hurricane, but we had frequent heavy rains. One day, we got slightly more than five inches of rain in just two hours, as a result of a nearby hurricane. We often got slammed with all kinds of torrential rain." The logistics of transporting all the various components of wind turbines 25 miles from the nearest highway, on a single roadway, was another challenge-even in building the access road. There was an existing road off the main highway, which they were able to upgrade. But the rest was a major project on its own. Mortenson staggered the trucks so on certain days, in certain time windows, the road was dedicated to aggregate deliveries. "With the extreme heat, we placed a lot of the concrete in the evening and brought the placement crews in at midnight. It wasn't quite as hot, the winds weren't quite as strong, and we were able to mix quality concrete on site." As with all of their projects, Mortenson went to great effort to use local trades workers, and local suppliers. "In spite of the remote location, we were still able to buy a lot of materials from suppliers in the region, and in Texas, and use local people." When the concrete delivery schedule ended, the road was then dedicated to turbine deliveries. Maag noted that each wind power project brings its own unique challenges, and Penascal was no different, especially with its remote location. "It could be close to an hour of driving time from the time you turned off the highway to the time it would take to get to an actual turbine site." Penascal II is Mortenson's 84th wind farm project. The company expects to finish its 100th wind farm project late this year, or early in 2011.
wetlands on the coast, near the Penascal site location. "We still would have had to build additional road if we brought material in by water," said Maag. There were several wetlands on the project site itself, as well. From turbine locations to roadbuilding, the project layout was done to have no impact. It's quite different from other wind projects, where the road might follow more of a grid pattern. "This road kind of snakes around the site," says Maag. "The road follows more of the wetlands-from the road to the turbines, the project flows very well with the natural environment in the area." With large construction projects such as Penascal, and the large amount of land involved, progress can be a bit slower at times due to meeting the needs of multiple landowners. Mortenson and project owner Iberdrola Renewables were fortunate in that they only had to deal with one landowner-the John G. Kenedy Charitable Trust. "They were extremely good to work with, and very accommodating, so it really streamlined the entire construction process."